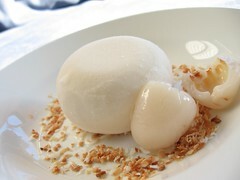 Lychee and Coconut Milk Sorbet - Do You Know The Muffin Man? Notes: This is easy-peasy: no cooking, just blitzing canned lychees and mixing the other ingredients together. For an added flavour kick, I added Soho lychee liqueur as well. This is sorbet as I like it: intense, pure flavours.